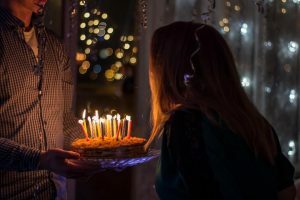 The cake, candles, and party we typically have today to celebrate someone’s birthday go back farther than you might think. Your ancestors celebrated a person’s birthday differently than you do today. In ancient Egypt, only the Pharaohs celebrated their birthday. There is a Bible reference to the birthday of a Pharaoh. The Pharaohs were not celebrating their personal birthday – they were celebrating their “birth” as a god. The reason you celebrate your birthday with a cake and candles goes back to ancient Greece. They offered moon shaped cakes to Artemis (the lunar goddess) as a tribute. Lit candles gave the cake a glowing effect. Romans were the first to start celebrating birthdays of male friends and family members. Men who celebrated a 50th birthday received a special cake made out of wheat flour, olive oil, honey, and grated cheese. Women’s birthdays were not celebrated until the 12th century. In the 18th century, Germans started celebrating children’s birthdays with Kinderfeste and a sweet birthday cake with candles. A child was given one candle for each year they had lived, plus a few more that symbolized the years to come. Children made a wish and blew out their candles. In Victorian times, mothers organized elaborate parties to celebrate a child’s birthday. One purpose of the event was so a family could show off how wealthy they were. The other purpose was to teach children the manners they would need in order to assume their place of privilege in society. Most of the guests were adults, who likely brought their children with them. Party games were ways to teach social functions. For example, boys learned how to lead in formal dances. The cake was either a fruitcake or a nut cake that was decorated with candles. Children received a gift or two from their parents on their birthday. A large household staff was required to make these elaborate birthdays happen. By the 1920s, children’s birthday parties became small. Mothers allowed their children to choose who the guests would be. Parties were small (and easy for mothers to clean up after.) Some families held “Sweet Sixteen” birthday parties for their daughters. It was the middle class version of the debutante balls held by wealthy people. By the 1950s it was expected that every child should have a birthday party celebration. Mothers who didn’t hold birthday parties for their kids were seen as neglectful. This is when themed birthday parties started happening – with cakes to match. Games like “pin the tail on the donkey” were popular. By the 1980s it was common for parents to hold their children’s birthday parties outside of the home. Parents got a reservation at McDonalds and held the party there. Other options includes Chuck E. Cheese, Play Places, or video arcades.